What day(s) and hour(s) will Mini Maker Faire be open to the public? Plenty of street parking in Wynwood. Valet is also available (for a small fee). Handicap parking is located behind the venue on NW 25th Street. Please email the event organizers (miamimakers@gmail.com) in advance if you have any RV or large vehicle parking needs. Use the metrorail to take either the Allapattah (use Santa Clara station) or Biscayne (use Brickell Station) Trolleys, which have stops within a few blocks of the venue. Limited bike parking will be available on-site - so get here early! Some parts of the venue will not be accessible to animals but dogs are ALWAYS welcome at The LAB Miami! Please come prepared with the proper restraints in case they are required (we're not saying your dog is trouble but you never know how they'll react to some of the crazy contraptions you'll find at the Miami Mini Maker Faire). Absolutely! Email us at miamimakers@gmail.com and we will fill you in. Please put "I want to volunteer!!" in the subject line. The show MUST, and will, go on! Bring rain gear to keep you dry when walking outdoors. Fortunately, most of our exhibition space is indoors so you'll be sure to keep the family dry. Have questions about Miami Mini Maker Faire? Contact MIAMade, Inc.
MIAMade seeks to foster and support a sustainable manufacturing and DIY community in the Greater Miami area. MIAMade connects innovators and entrepreneurs, promote hackerspaces and locally-made products. The original Maker Faire event was held in San Mateo, CA and in 2015 celebrated its tenth annual show with some 1100+ makers and 145,000 people in attendance. World Maker Faire New York, the other flagship event, has grown in four years to 600+ makers and 80,000 attendees. Detroit, Kansas City, Atlanta, Milwaukee, Orlando, Pittsburgh, San Diego, Silver Spring, Ottawa, Lisbon, Paris, Rome, Berlin, Newcastle, Hannover, Oslo, Trondheim, Seoul, Singapore, Taipei, Tokyo, and Shenzhen are the home of larger-scale, “featured” Maker Faires. In addition, over 120 community-driven, independently organized Mini Maker Faires are now being produced around the United States and the world—including right here in Miami. Make: unites, inspires, informs, and entertains a growing community of resourceful people who undertake amazing projects in their backyards, basements, and garages. 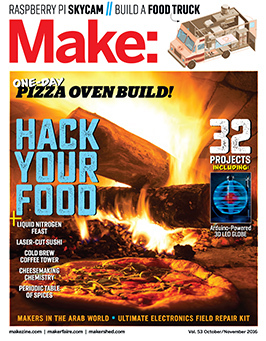 Make: celebrates your right to tweak, hack, and bend any technology to your will.